When we think of indulgence, the first thing that comes to mind is smooth, dark, rich chocolate. Anything from a dull day to a roaring bad mood can be instantly remedied with a bar of chocolate. No wonder that it’s called the food of Gods! “A” likes his chocolate dark and dreamy and I like my chocolate rich and creamy – so between the both of us, we pretty much have a good collection. 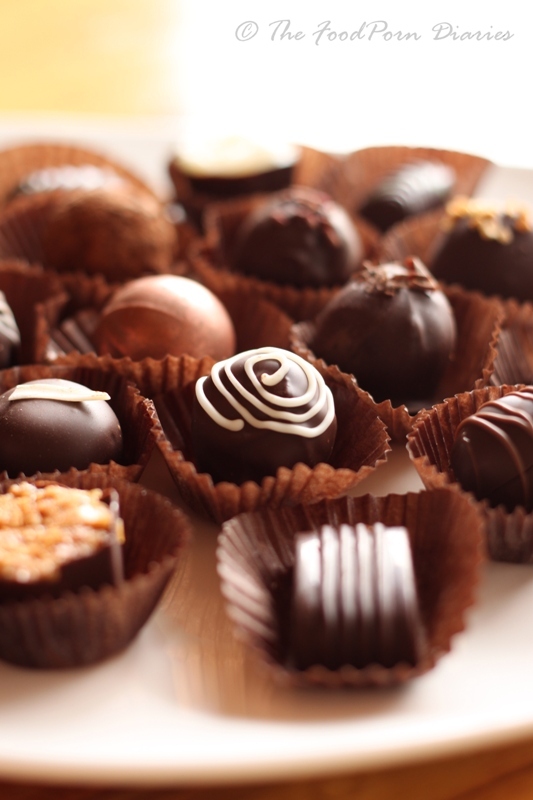 Dark Chocolate, Milk Chocolate, White Chocolate, Chocolate with Nuts, Fudge, Mini Truffles…ok, the list kinda goes on! So when I walk into a Chocolate Cafe, you can bet your bottom dollar I’m going to go crazy! 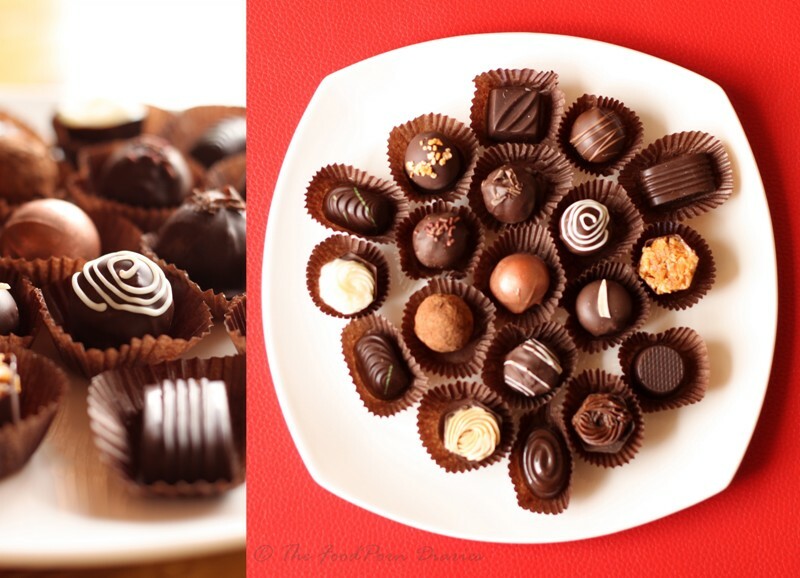 Jus’ Trufs call themselves ‘customized chocolatiers’ and have been crafting premium truffles since 2001. Chenddyna Schae is the lady behind the brand and her love for fine chocolate easily translates into a beautiful end product. 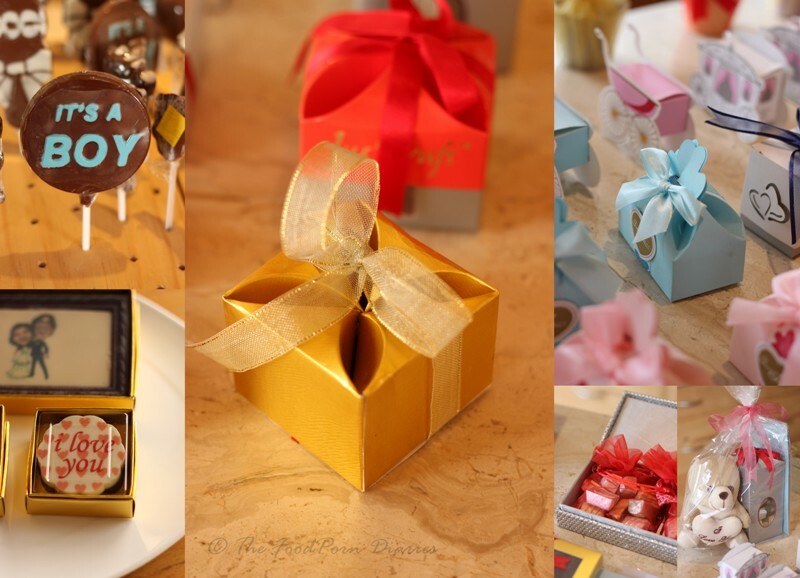 While the focus all these years has been on corporate clients and event based gift boxes they have recently opened a lovely Chocolate Café to let people come and indulge in some chocolate love. They are located on Jakkur Main Road and while this might seem very far away for most of us – it is also a welcome respite for people living in that part of town. We stumbled in on a Sunday afternoon and were greeted by an airy and cheery space with a huge counter at the back displaying all the goodies on offer. While I was making a mental note of everything I need to take back home, my stomach was grumbling and I decided to grab a bite first. 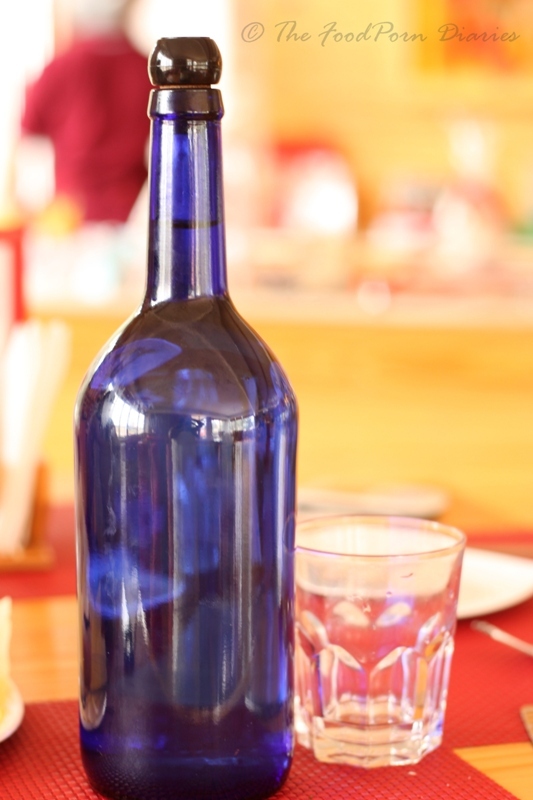 The café menu is concise and has the usual suspects of burgers, sandwiches, pizzas and pasta. But then you flip the menu over and you realize that the food is but an accompaniment to the star product – the chocolate based concoctions! Our eyes were instantly drawn to the Hot Chocolate Shots. Now this is literally a shot…of pure dark melted chocolate! 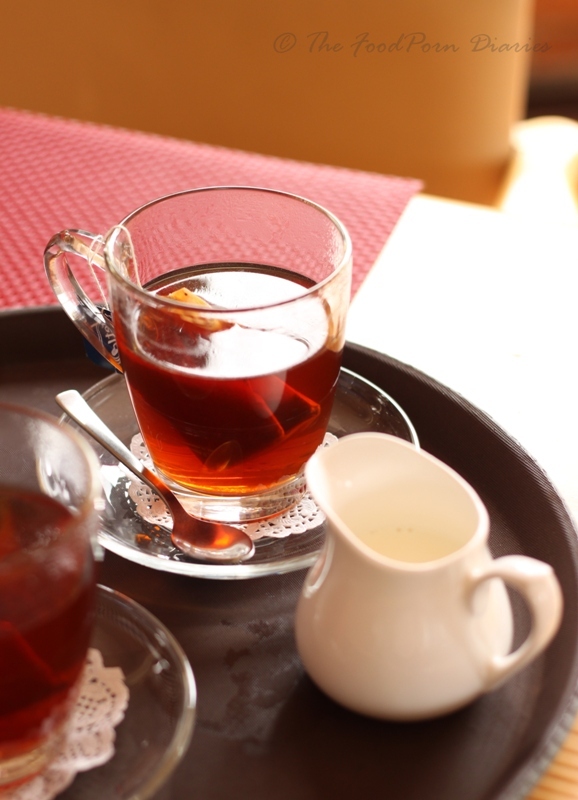 They offer two variations their signature dark (Rs.50/-)and their real dark (Belgian 60%) (Rs.70/-). We of course opted for the latter. It arrived in a shot glass (true to it’s name) and we started off the day with a chocolate bang! The owner later informed me that you can buy the liquid chocolate shot pouch and make your own ‘real shot’ at home with an addition of some liquor to the chocolate. *Slipping into the adult version of Charlie and the Chocolate Factory here*. Another fun element on the menu is the Chocolate sides where you can choose to order chocolate dips and sauces to accompany your meal. 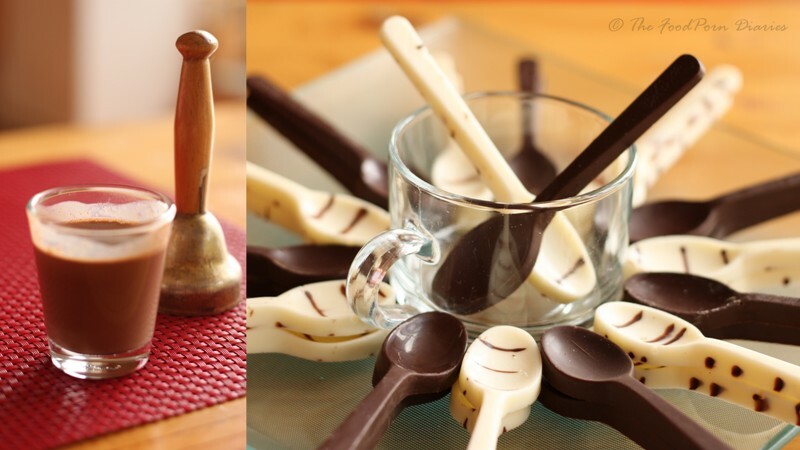 I loved the Chocolate Coffee Spoon (Rs.20/-) – a spoon crafted out of their signature white or dark chocolate that you can use instead of a real spoon to stir your coffee! We also ordered a plate of Fries, just so that we could try their White Chocolate Jalapeno Dip (Rs.30/-). Now while this might seem like an odd coupling, it actually works really well. The sweetness of the white chocolate marries beautifully with the heat of the Jalapeno and the salty fries just complete the trio! The menu lists a Hazelnut Chocolate Sandwich, a Chocolate Pizza and even a Chocolate Truffle Sandwich, but we decided to get something savory first. 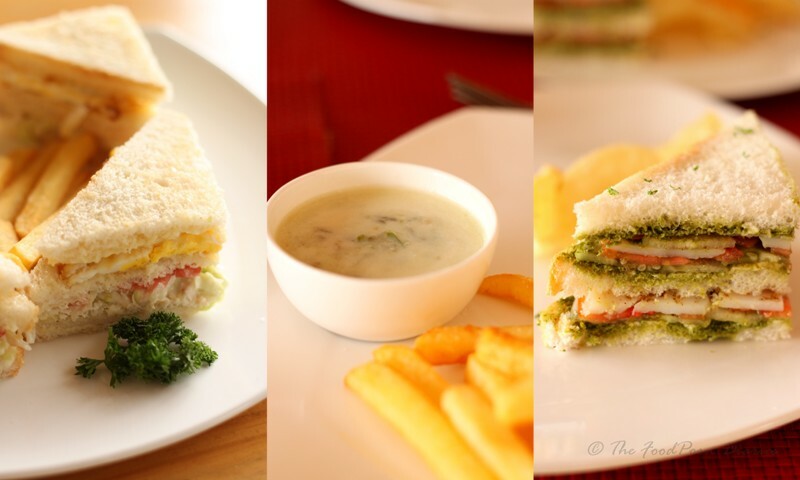 We picked the Bombay Sandwich (Rs.100/-) and the Chicken Salad Toasted Club Sandwich (Rs.200/-). A Bombay Sandwich is typical Mumbai street fare – a basic tomato-cucumber-onion-potato layered sandwich with the special Bombay masala. It’s the vegetarian equivalent to the Club Sandwich. I would have preferred my sandwich toasted, but apparently that’s a Bangalore rendition and so I let it pass. The Club Sandwich was filled with a chicken and mayo salad, egg and cheese. This one was toasted and automatically got a better rating in my books. Sandwiches are served with a generous helping of crisp fries. 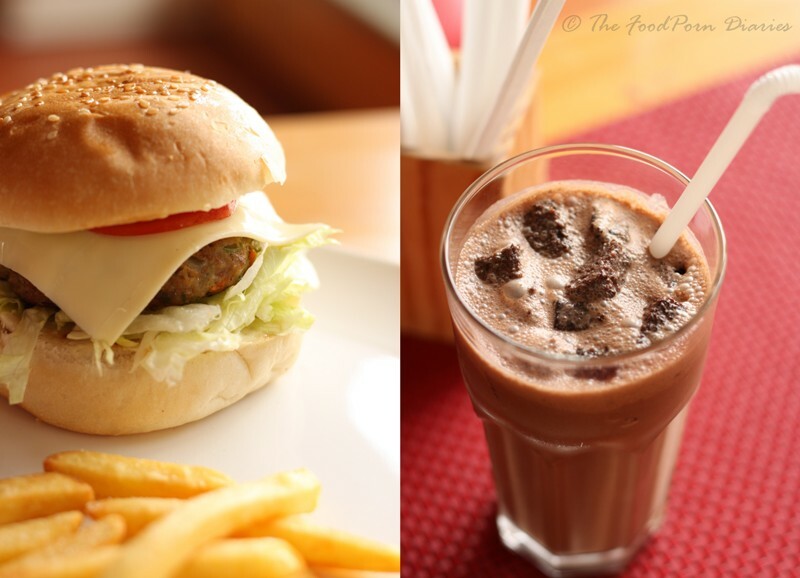 We also ordered a Burger De Pollo (Rs.200/-) – A chicken and Cheese Burger. The menu says ‘our in-house Hugh Grant helped design this’. I looked around for him that day – I seriously did, but I had to be content with the Burger. The patty was juicy and plump and was mixed with spices and minced peppers giving it the much needed hit of flavor. (Lamb and Beef bring their own game to the table, but the café does not serve either). The Pasta with their home made Pesto was supposed to be a crowd favorite, but we were saving space for something special, so we had to give that section a pass. The something special was a picture of a drink that was plastered on a board with a caption that said “It will change your life”! Now this I HAD to try. It turned out to be a chilled Belgian chocolate Milkshake topped with Fudge Cake (Rs.180/-). Yum, yummy, yum! It was rich, it was thick, it had fudge cake and boy, was it heavy! The space I saved was falling short and I’m glad we decided to share this one! Jus’ Trufs also has a great range of cupcakes and cheesecakes on display. Since our tummies were filled to the brim, we took some home for the family. We tried the Dark Chocolate Ganache and the Black Forest (Rs.70/-). The surprise winner was a Blueberry Cheesecake Cupcake (Rs.70/-). Think cheesecake in a cupcake mould! They also specialize in the Baked New York Cheesecake in different flavours (wild cherry sounds fun!). The owner told me they use Philly Cream cheese and that’s what makes all the creamy difference. 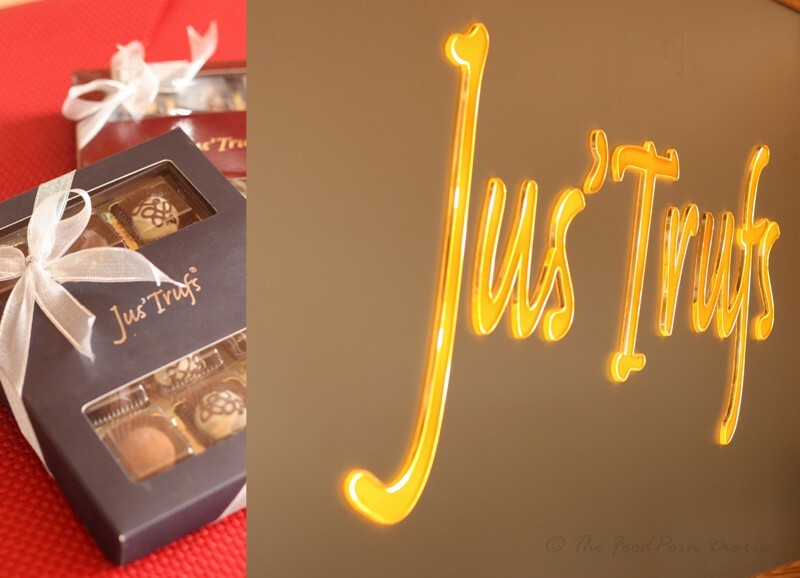 Jus’ Trufs is a wonderful little hideout for chocolate lovers of all ages. Though you can order online (Delivery charges = courier charges) the café is a great place to see and try a variety of their offerings, before zeroing in on the ones you like. And if you are in North Bangalore, you can thank you lucky stars that you have another option to your Coffee days and Baristas. (They serve chai and coffee too J). While Bliss or The Chocolate Room advertise themselves as Chocolate Lounges, Jus’ Trufs prefers the tag ‘Café’. They aim to serve simple homestyle food in a relaxed setting (service is slower than most places) that serves as a backdrop to their gorgeous chocolate treats. The chocolates have always been and will always be their USP. Interesting post. Dishes which engaged my attention were white chocolate jalapeno dip (thoughts of bravura fusion) and hot chocolate shots (no frills,just hit where it pleasantly hurts the most). Terrific photos as usual, tea shot is classic!